Solar Impulse completed its circumnavigation of earth in 2016. Using only solar energy, the Swiss airplane started its flight from Abu Dhabi, United Emirates, in March 9, 2015. Bertrand Piccard and André Borschberg, the co-founders, wanted to show that flight was possible using only solar energy. Michael Phelps earned his 28th Olympic Medal in 2016. He did not medal during the 2000 Summer Olympics swimming events. At the 2004 Summer Olympics he earned six gold medals and two bronze medals. At the 2008 Summer Olympics he won eight gold medals. During the 2012 Summer Olympics he earned four gold medals and two silver medals. At the 2016 Summer Olympics he won five gold medals and one silver medal. National Museum of African American History and Culture opened in 2016. Located on the National Mall in Washington, DC, the building houses about 33,000 artifacts. The Smithsonian Institute began construction of the building in 2003. Children can learn more at: https://nmaahc.si.edu/. 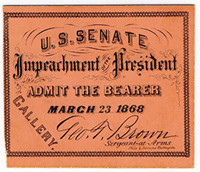 Andrew Johnson’s impeachment trial ended in 1868 when the Senate failed by one vote to find him guilty of the charges. Children can learn more at: Johnson.